It’s never too late to regret. 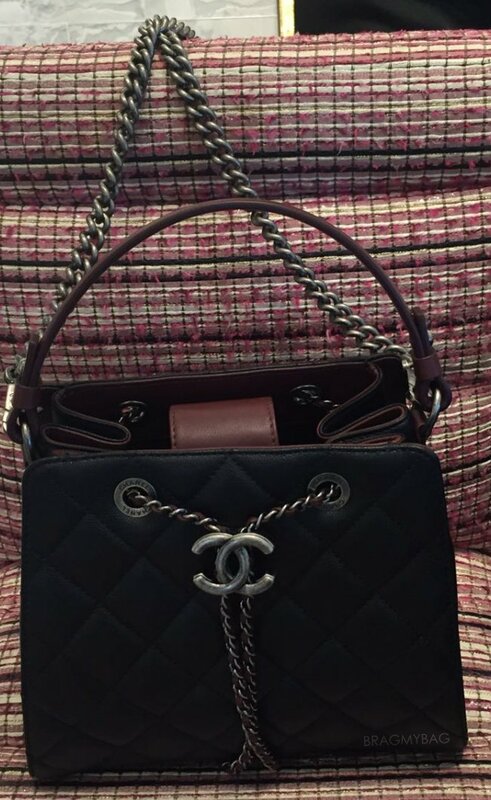 Let us present you the Chanel CC Bucket Bag for the second time. And as you can see, the bag is ridiculously gorgeous. Of course it’s quilted, but take a detailed look at the chains, the strap, the eyelets and the oversized CC logo on the front. Everything is just perfect. The front features the classic leather woven chain and an oversized CC logo to tighten or loosen your bag, both gorgeous and functional. If you like you can carry the bag by hand, just hold the comfortable leather handles. Or you can choose to carry the bag on your shoulder, check out the oversized boyish chain strap. The lucky owner of this gorgoeus bag is Kitmin – congrats with your new purchase. Priced at $3100 USD via Chanel boutique. Attention please, presenting another Wallet with Chain for the Cruise 2016 Collection. 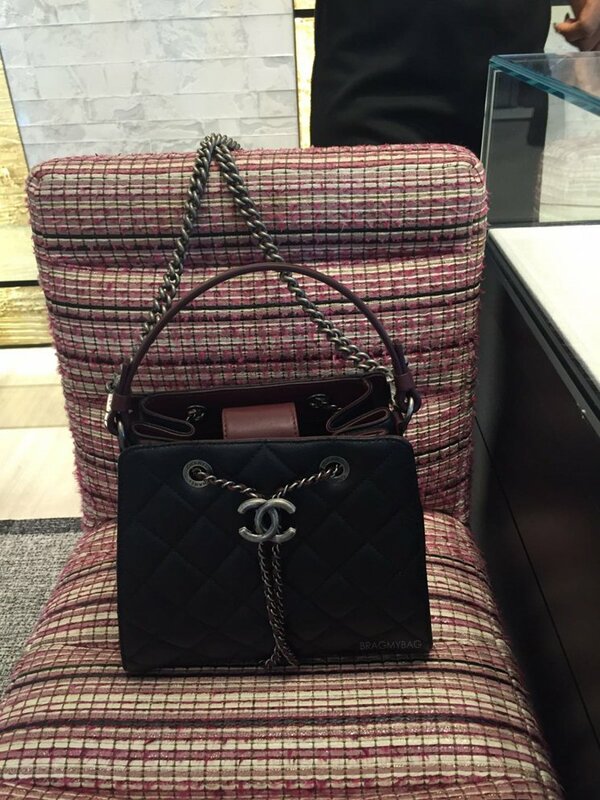 We have followed Chanel for quite a while, and some bags are one-time only and will never come back again in the future Collection. These two-tone Wallet with Chains are one of them. If you’ve fallen in love with this bag, we fully understand. It’s perfect for the evenings – this is the final piece to match your favorite dress. The Wallet on Chain has a vintage appeal, especially in the unique mix of color – grey and burgundy. The chain can be removed so that the bag can be changed into a clutch bag. The interior comes with a small red pouch, which is really cute. You will also love the back pocket to store your instant-essentials. Measuring 4.7’ x 7.5’ x 1.2’ inches, style code A81025, priced at €1670 euro. The flap wallet is measured 4.1’ x 7.7’ x 1.2’ inches, style code: A81024, priced at €880 euro. Here at BragMyBag, we’re after the best pieces you could possibly own, and by that kind of standard, we are always on the lookout for new stuff (or reinventions). We’ve found the Chanel Two-tone WOC, a treasure you might say since it’s really a beauty. Gone are the days when you could sport only one color – this baby is made for double the fun! Measuring 4.9” x 7.5” x 1.4” inches, this baby is practically the bomb: made with only the finest lambskin, you’re assured that you’ll be getting the most out of your purchase! With proper care and use, expect this baby to last you some years of sportin’. Also, can we talk about how luxe the two-tone detailing on this piece is? The contrast of colors is absolutely amazing! The gold chain and signature ‘CC’ adds more style points than usual, too. Priced at €1,915 EUR, you can get your very own Two-tone Wallet on Chain via Chanel boutique. Oh, my Boy! Well, what do we have here, it’s the Boy Chanel Two-tone Wallet on Chain Bag! And since we know that most of our gals in the community are hungry for more Chanel pieces, we’re going to do a feature on this piece. Ain’t that exciting? Nothing like a designer piece to keep all the blues away! Of course, let’s zero in on the details – from the description itself, it’s a bicolor calfskin piece that’s bound to impress even the most discriminating bag aficionado. Calfskin is really a breeze to care for, and if given adequate attention, you may be able to use this baby for long. Also, let’s not forget about its iconic ‘Boy’ clasp, which, aside from its shiny silver tone, has a colored touch that mimics the blue background beautifully. Inside, it’s even better – it has zipped and flat compartments that will surely please all practical divas out there! Measuring 4.9’ x 7.5’ x 1.4’ inches and with a style code of A80746, you can get your very own Boy Two-tone Wallet on Chain for €1,760 EUR via Chanel boutique.